For the Bank “Bai-Tushum and Partners” in honor of the International Children’s Day became traditional the rendering of charitable support to orphanages, social and vulnerable children, including children from asocial families, special needs children, to boarding schools and other social institutions through participation in financing on purchasing of necessary goods or organizations of holidays, and likewise rendering other help. “The best of our life is related to children, – noted Gulnara Shamshieva, General Manager of CJSC “Bai-Tushum and Partners” MF Bank. Therefore our main goals, for us – adults are to protect rights of each child, to surround children with care and kindness, and to give them joy and our attention. “Bai-Tushum and Partners” carries out support of child care facilities for 12 years. For the last 4 years the Bank rendered charitable and sponsor’s support to children and child care facilities throughout Kyrgyzstan for amount more than 2 million KGS”. In this year, charitable actions of the Bank covered more than 1500 children which received support in kind of address delivery of gifts with sweets, grocery packages, toys and office supplies. By the holiday, the Bank helped to solve number of problems of several child care social facilities with which staff of the Bank is connected by long-term friendship. 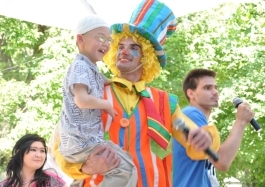 * Residential treatment center for special needs people, Bishkek city.